Mid-cap funds have lagged behind lately, but they are poised to perform over the long term. Here we tell you what to look for in them, writes Mahesh Nayak. When markets roil, it's the large caps that usually get knocked over first, given that they are mostly held by big foreign investors, followed by the mid- and small-cap companies. In a rebound, a similar drama unfolds with large caps bouncing back faster and higher, even before the mid-caps begin to stir. That has perhaps prodded investors to wonder whether they should park money in the more solid large-cap funds, or decide on a more aggressive stance in the mid- and small-cap funds that could take a while to recover. Over the last year, the BSE Mid-Cap Index returned a handsome 28.5 per cent as against 21.5 per cent of the large-cap dominated Sensex. But this out-performance has given way to underperformance in the last two months. Since June 30, 2007, Sensex lost 1.5 per cent but the Mid-cap Index tumbled 5.2 per cent. So, given that the market volatility is here to stay for a while, is this a good time to buy mid-cap funds? The bad news is that the short term may not treat the mid-caps stocks too well. They could meander and, in a sell-off, even fall faster than the large caps despite having already dropped some. A few fund managers are worried about entering mid-caps now as there's still plenty simmering below the surface. S. Naren, Senior VP and Head (Equities), ICICI Prudential AMC, feels that it's early to foray into mid-caps now. "The first stocks to bounce back will be the large caps and then the mid-caps. At such times, I feel it is better to bet on large caps." He also feels that the recent crash, which was predominantly in large-cap stocks, will make them more attractive compared to mid-caps. With the subprime chill still hovering around the market and the fluid domestic political situation, the markets are likely to lay low for a while. Says Nilesh Shah, CIO & Deputy MD, Prudential ICICI AMC: "The pressures could mount on mid- and small-cap stocks due to local or international developments. Once mid-cap stocks take a hit, they fall like a pack of cards. For now, it is better to stay away from them." But that's the short-term story. The longer-term one still favours the mid-caps as they have the potential to outperform the large-cap stocks. The Indian economy is on a firm growth track, smaller companies can scale up faster and clock better growth rates. While the mid-caps may toss for a while longer, there's the faster growth story that makes them look attractive relative to the larger-cap companies. Says Mihir Vora, Senior VP and Head (Equities), HSBC Asset Management Company: "Even in this volatile market, I don't mind parking 100 per cent of my corpus in mid-caps. However, the time horizon for investment should not be less than three years." His fund (HSBC Mid-cap Fund) has been one of the top seven mid-cap funds along with Birla Mid-cap Fund, Magnum Emerging Business Fund, ICICI Emerging Star Fund, Reliance Growth Fund, Magnum Mid-cap Fund and Kotak Mid-cap Fund. All these funds have beaten the BSE Sensex, the BSE Mid-cap Index as well as their respective benchmark. Over the last year, compared to Sensex, the mid-cap funds have outperformed the diversified funds. 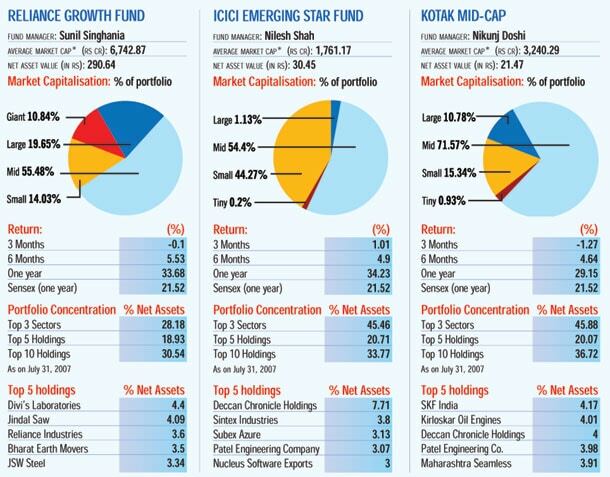 Of the total 21 mid-cap funds, 71 per cent or 15 funds have outperformed Sensex. Compared to diversified funds, only 135 funds or 57 per cent of the 237 funds have beaten the benchmark Sensex. When compared to their respective benchmark, 12 mid-cap funds or 57 per cent of the total mid-cap funds outperformed their respective benchmark as compared to the universe of diversified funds, which saw a 51 per cent (121 out of 237 funds) outperformance. The future also looks bright if you can ignore some of the excesses of the market in the short term. Says Vora: "Today's small- and mid-cap companies are going to be tomorrow's large cap. Mid-cap stocks are high growth ones, but are less liquid and volatile. If one can ignore volatility in the short-term, mid-cap funds are the best for building a fortune over the future." Agreeing with Vora, Sunil Singhania, Fund Manager, Reliance AMC, says: "In mid-caps you don't chase momentum. Our strategy has also been to pick high-growth companies at right valuation and even if a stock comes down, we are not worried as long as the fundamentals of the company remain sound." But investors can take comfort from the fact that some funds have taken steps to withstand the volatility by aligning their portfolios to market conditions. In fact, the illiquidity in mid-cap stock has seen funds like Birla mid-cap (top performer among mid-cap funds), Reliance Growth and Kotak Mid-cap Funds taking position in some of the bigger companies. Says A. Balasubramanium, CIO, Birla SunLife Mutual Fund: "We have to create a buffer at times of uncertainty. Investing in large cap helps us to liquidate position at the time of redemptions. Secondly, some mid-caps have grown to large caps, thus increasing our exposure to large caps." These three funds have an average market cap in the range of Rs 3,300 crore to Rs 6,750 crore. Unlike these, the others have stocks invested with an average market cap of less than Rs 2,000 crore. On other hand, other funds take concentrated bets on stocks and sectors to get their performance. Sanjay Sinha, CIO, SBI Mutual Fund, has two funds-Magnum Mid-cap and Magnum Emerging Business Fund-among the top mid-cap funds that have taken concentrated bets in his portfolio. Says Sinha: "Stock picking is the key. We are not afraid to take concentrated bets as we believe most of our picks are jewels of tomorrow. However, we ensure that the stocks we invest in are liquid ones." In the Magnum Emerging Businesses Fund, top 10 holdings account for 65 per cent of the total corpus with Crompton Greaves accounting for nearly 10 per cent of the total corpus, while in Magnum Mid-cap fund, the top 10 holdings account for 45 per cent of the total corpus. These funds, however, require some time to generate the returns for investors because it may so happen that the mid-caps could meander for a while longer than normal. Says Balasubramanium: "Investing in mid-cap funds should be on the philosophy of fill it, shut it and forget it." Investing in mid- and small-cap funds comes with risks such as above average volatility, impact cost and time taken to unlock value. However, over the long term, at least 3-5 years, the volatility gets ironed out as they realise their true potential.